Featuring the beautiful Mary Gillick portrait of a young 26-year-old Queen Elizabeth II without her crown. As the Queen celebrated her ninetieth birthday in 2106, our nation honoured the remarkable life of the little princess who was never meant to rule but became Britain’s record-breaking monarch. In 1952, the Nottingham-born artist Mary Gillick was chosen from sixteen other candidates to prepare the new Queen’s first coin portrait. She was able to sketch Her Majesty in person and, after their sitting, was said to have exclaimed, ‘I am now her devoted slave forever!’ Gillick’s delight in the young monarch is clear in her simple, uncluttered portrait – the only one to show the Queen without a crown – which reflected the optimism of the new reign. The effigy appeared on the coinage from 1953 to 1967 and is still used on the Maundy money distributed annually by Queen Elizabeth II. 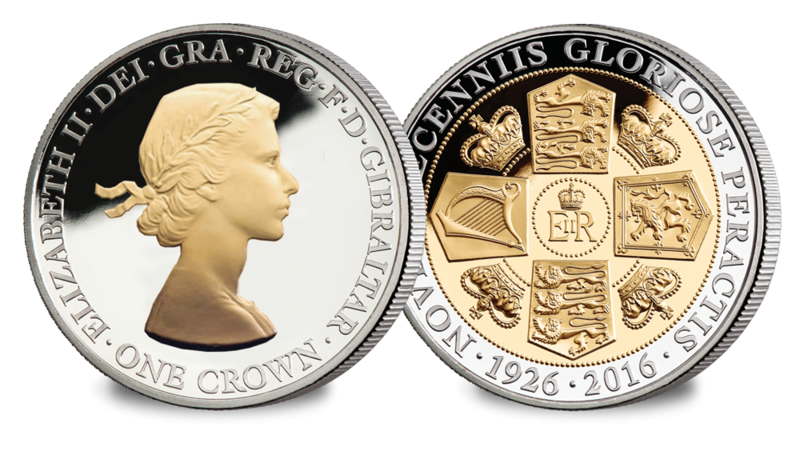 The obverse of the coin features an uncrowned portrait of the Queen facing right (the opposite to her predecessor), bare-shouldered, adorned with a simple classical laurel wreath tied with a ribbon – quite the striking image. The reverse symbolises the shields of the Royal Arms. Located at the north and south positions are the shields that represent England, containing three lions passant. A lion rampant represents Scotland in the east position, and to the west is a harp that represents Ireland. The four quadrants depict the St. Edwards crown, encircled by the Latin inscription ‘NOVEM DECENNIS GLORIOSE PERACTIS’ (nine decades gloriously accomplished). The year dates 1926-2016 represent Her Majesty’s 90th Birthday.